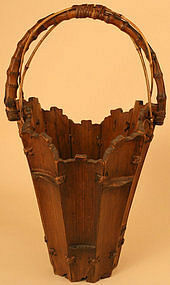 Spectacular 19th Century Japanese Bamboo Ikebana Basket. A real masterpiece. 39.5 inches (100cm) tall, 11 inches (28cm) wide. 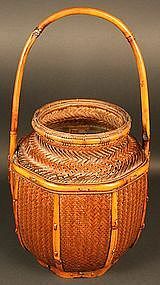 Early 19th Century Edo Period signed Japanese Ikebana flower arranging wall basket made of bamboo woven by the master, Mineko, with wonderful color and design. Wall baskets of this quality are hard to come by. 8.5 inches (21.5 cm)h x 3.5 inches (9 cm)w. Excellent Condition. From a prominent and widely exhibited collection. 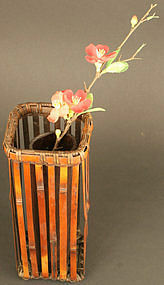 Antique Japanese Ikebana flower arranging basket made of bamboo with an unusual sculptural image. 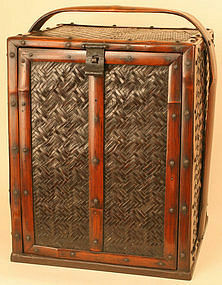 It features large pieces of bamboo joined together to create the container, with a wonderful handle. 19.5 (50 cm) tall. Excellent Condition. From a prominent and widely exhibited collection. 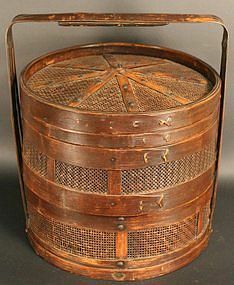 An unusual and important early 19th Century Edo Period Woven Bamboo Tea Ceremony Box. This unique work of art is the only one we have seen like this. Expertly woven bamboo accented with a large bamboo handle. A rare find for the serious Japanese basket collector. Wonderful color and patina. You are not likely to see another on the art market. 17.5 inches (44.5 cm)h x 12 inches (30.5 cm)w x 10 inches (20.5 cm)d. Excellent Condition. From a prominent and widely exhibited collection. 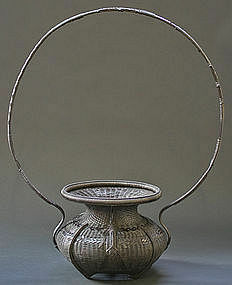 An exceptional Edo Period Ikebana flower arranging basket. 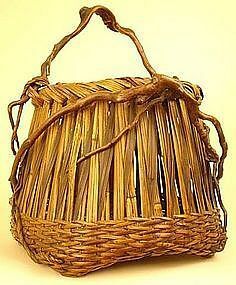 A wonderful addition for the collector of important baskets. This work of art features a monumental handle and wonderful shape. 33 inches (84 cm)h x 23.5 inches (60 cm)w. Excellent Condition. From a prominent and widely exhibited collection. 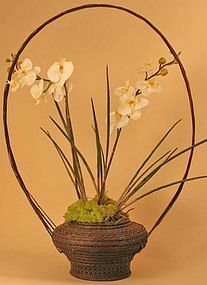 A unique early Japanese Ikebana Basket with a rich camel colored bamboo entwined with Wisteria vines with a single, beautifully twisted and gnarled Wisteria branch. Highly sought after by the discriminating basket collectors. Edo Period, circa 1850. 14 inches (35.5cm) tall x 12.5 inches (31.5cm) wide. From a widely renowned and published collection that has been exhibited at the Metropolitan Museum and Japan Society.